Last week we featured an interview with Sue Purkiss, who is a children’s author (you can read that right here). 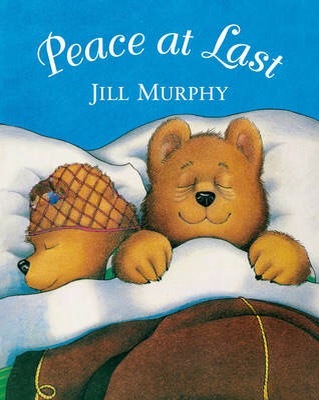 Sue mentioned her favourite book to read to children is Peace at Last by Jill Murphy. It’s also one of our favourites. So we thought we’d share it with you. I imagine most adults will have read this book to children at some point. Peace at Last is a great book to read to children. It is fun to read, but also fun to listen to – whether you are an adult or a child. It has some repetition in with the “I can’t stand THIS” from Mr Bear. It also features onomatopoeic words. (We love that word, remember learning about it at school? In case you need reminding – an onomatopoeic word sounds like the word it is describing. Eg. “NYAAOW” and “TICK-TOCK“). Children love this because there’s lots of opportunity for them to join in and make the noises too, and of course the more you read it the more they will join in. Jill Murphy has written some classic children’s stories including Five Minutes Peace – about the ‘Large’ family of Elephants. The Worst Witch, and Whatever Next (about Baby Bear wanting to travel to the moon). I love reading classic children’s books to my charges. In particular the ones I remember being read to me when I was young. Peace at Last and Whatever Next are examples of this. Peace at Last was first published in 1980! There’s quite a lot to talk about in this book. Children will be engaged in the story. We also found this resource great for even further ideas. What are your favourite books to read to children?